Walking down a dirt road strewn with rubble and refuse, past new concrete block apartment buildings, we pass some kids playing soccer and kicking up mounds of dust, a work crew mixing cement, and a tall skinny man leaning back on a stoop reading a book. He looks so relaxed, he could be sitting in a park listening to the birds. We stop and say hello he gives us a quick glance, closes the book and invites us in. I ask what he was reading and he says a psychology book. He is a retired psychologist from Baghdad who came to Damascus two years ago. 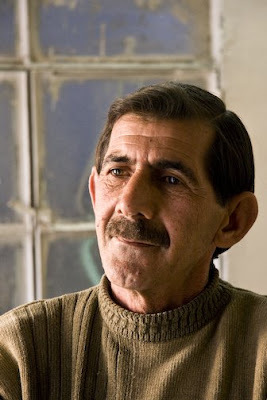 He introduces himself as Hadi, and explains it means “quiet man”. “I love quietness” he says with a smile. As the cement mixer grinds and the kids shout, Hadi is an island of gentleness and calm amidst the turbulence. He left his wife and children and came to Damascus because the intense violence frightened him. His family has moved to his mother-in-laws house. His wife continues working and the children are in school. “My oldest is at the top of her class in all Iraq” Hadi says with pride. He doesn’t answer when i ask how he came to be the only family member who left Baghdad. When he first arrived he applied at the UNHCR for refugee status, but when it was time to renew, his friends told him it could take 6 months. “I disliked this idea, and I decided not to bother”. He says he speaks with his family often, and while they say the situation is better in Baghdad, it is not yet safe to return. Hadi says he may return in 3 or 4 months, as his life is lonely and it is expensive to live as a refugee. I ask how he thinks Iraqi children will fare over time. He is optimistic. He believes Iraq will be very nice in 10 to 12 years. “We have the first culture in the world. I think we can renew everything” Hadi exclaims confidently. “Iraq just needs time.” Hadi doesn’t have an explanation for the cataclysmic violence that has shaken Iraq since 2003. “Iraqi people have a very nice culture and good abilities. It is a very wealthy country and we can use its wealth to renew us. I love my country as you love yours”, he says. “Iraqis have no value in any other country in the world. It is a terrible fate. It leaves me very sad. But it will get better!” he exclaims. I ask him what it will take. “First people must change their souls. Then people need to understand life better. We need to dismiss violence in order to develop conditions for peace. There is nothing better than peace and love!” I wonder if all this can be accomplished within Hadi’s timeline, but he is the first person in a month to be optimistic about the fate of Iraq. He invites me back another time to enjoy a cup of tea.